I've danced around the issue, but, for this post, it's time to acknowledge that my daughter's first marriage didn't work out. There are many reasons why but it just didn't work out. She's got a new beau, Larry, and mom is quite happy with this one. There's a lot more in common and a lot more mutual respect. One of the big things they have in common is playing games. The ex was okay with game playing so long as it was the games he wanted to play. Larry doesn't care. It's about the experience of playing games with friends and family. Winning or losing is immaterial. Playing games, from card games to board games to role-playing games to online games, has long been a part of our family life. From the earliest times when Carole learned to play Candyland to now when she's off playing online games that are quite complicated, gaming is something she does. That Larry shares her interest in games is a huge plus. I have long been jealous of my friends, April and Perry, who had a long running Monday Night Game Night where they got together with a bunch of friends and played anything and everything. There are a lot of studies which talk about how games keep your brain learning and learning staves off dementia. My ability to understand what April and Perry and friends were playing was limited. I sometimes felt as if the synapses in my brain just gave up. But their game nights were also more about being with friends, which, of itself, helps keep a myriad of health problems away. If I had a boat load of friends nearby, I'd try to have game nights once a month. So, I was excited to play games with Larry and Carole while I was on vacation. We got out our sodas and cookies and had a ball. 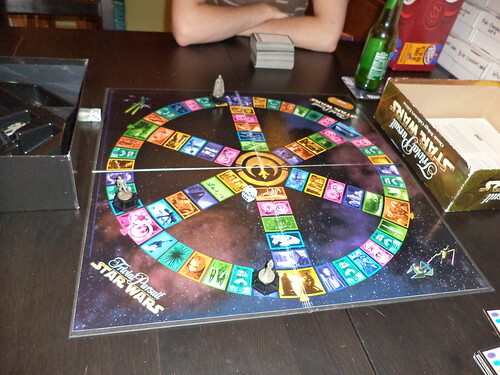 The first game we played was Star Wars Trivial Pursuit. Holy Millennium Falcon, Batman. Talk about trivial. That Larry knew what color "x's" robe was when he was on x planet in the 3rd movie was impressive. He probably knows more than I've forgotten about the movies. Needless to say, he creamed Carole and I. After that, we played World of Warcraft Trivial Pursuit. Um...yeah. I redeemed myself, going from last place to first place. Carole quipped, "Well, let's see if we even get a turn" as she pulled up the first card to read to me. I don't know everything about WOW, just as Larry doesn't know everything contained in the Star Wars trivia. It's fun to run into a question you don't know, one that makes you sit back and say, "Really? I didn't know that." 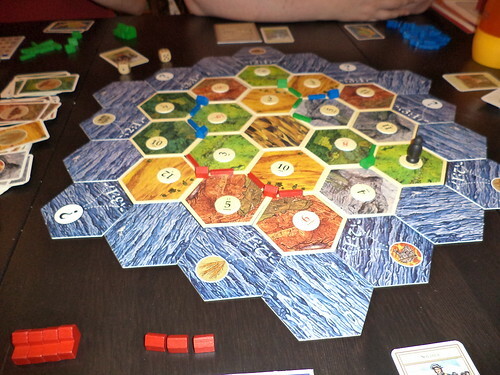 Later in the week, we played Settlers of Catan. I've played this before with April and Perry. It's a fun game and requires just enough strategy to not make me dislike it. I really don't like strategy games so you'll never find me playing something like Risk. Settlers requires thinking about where to build roads and towns, but there's the luck of the dice roll too, which you can't control. Carole is really good at this game and soundly beat Larry and I. 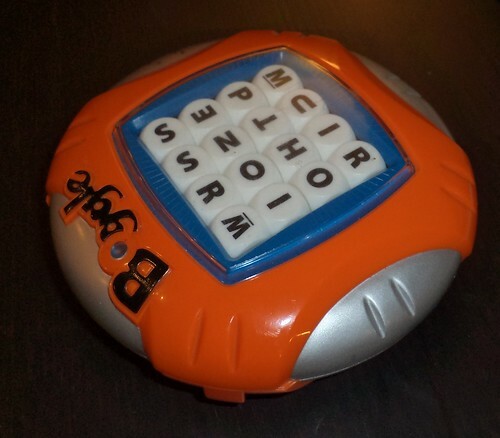 The last game we played was Boggle. Larry has a degree in computer science. Words are not his strong suit. Carole had, at one point, considered a double major in English and Anthropology, but opted just for Anthropology, so she can spell. Larry doesn't mind playing Boggle with her even though she can beat him by 100 points. He was looking forward to watching the two of us go head to head. I'm afraid I cannot keep up with my daughter. I have slowed down in word recognition. She sees words very easily and, while I can see some words she can't, she's much better at it than I. She won both games we played although the first game was closer than the second game. We went to lunch at Larry's parents' house on Monday and they also like to play games. We played one of the longest Uno games I think I've played in years. We also played Rat-a-tat Cat. This is a very fun card game from Gamewright Games. It's suitable for all ages. It was a lot of fun to play with Larry's parents, to see where he got his love of gaming from. I miss this. I have a large number of games in my closet that I'd love to play if I could get a group of people together. Mille Bourne, Scrabble, Disney Trivial Pursuit or Humble anyone? On Vacation-You Won't Forget Us, Will You?